One of the benefits of starting the Make A Ring A Month movement is that I get to choose the theme each month! I had already settled on texture as the theme for January and had a good idea of what I wanted my ring to look like. And weirdly it has ended up as I imagined it would (that doesn't often happen!). 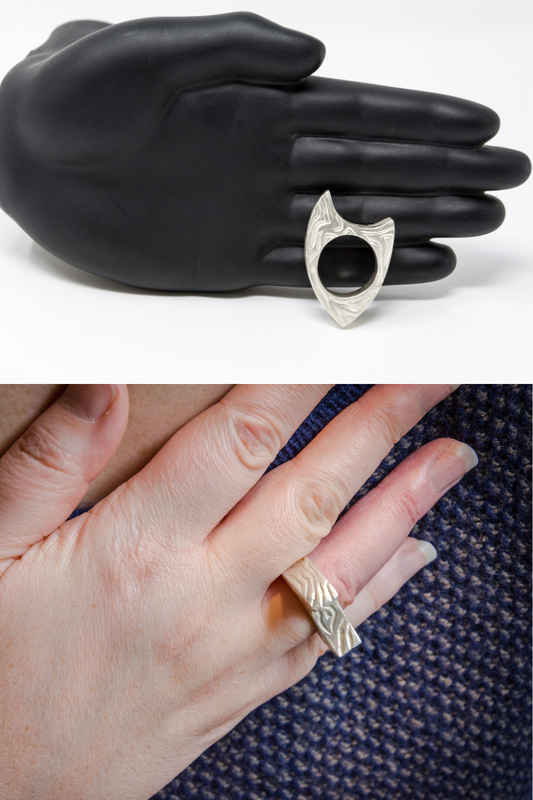 I decided to create a hollow form ring because I am a bit obsessed with making box forms at the moment. If you'd like to learn how to do that I suggest taking a look at this online course with Tracey Spurgin. I then carved into the silver clay to make the texture. I use the dockyard micro carving tools. I kiln fired the ring (I always recommend kiln firing rings as they need the strength of a long hot firing). I fired at 880 centigrade for 1.5 hours. Although I'll add here that I'm pretty sure my kiln is underfiring at them moment meaning that it is heating up to lower than the temperature it states. I need to do a proper kiln test for it but with Art Clay Silver I've found that it is a forgiving material and tends to work well within a good range of temperatures. The ring shrunk 4.5 UK ring sizes. I was expecting a large amount of shrinkage because the larger the piece the more there is to shrink. I polished the ring with my portable foredom mini micro motor. I chose this polisher because I am often travelling to teach and it is a really handy size to pack. And here it is, the finished ring! With thanks to my lovely husband Gary for the photos. If you'd like to take part in the Ring a Month challenge you are welcome to join in! All styles of jewellery and levels of jeweller welcome. The theme for February has been announced. You can join on Facebook or Instagram (or both).